A single injection of a new treatment has reduced the activity of the gene responsible for Huntington’s disease for several months in a trial in mice. Huntington’s disease is a genetic disorder that affects around 1 in every 10,000 people and damages nerve cells in the brain. This causes neurological symptoms affecting movement, cognition and behaviour. Huntington’s usually only begins to show symptoms in adulthood. There is currently no cure and no way to slow the progression of the disease. Symptoms typically progress over 10-25 years until the person eventually dies. Huntington’s disease is caused by a mutant form of a single gene called Huntingtin. The zinc finger protein works by targeting the mutant copies of the Huntingtin gene, repressing its ability to express and create harmful proteins. In the new study involving mice, published in the journal Molecular Neurodegeneration, the injection of zinc finger repressed the mutant copies of the gene for at least six months. In a previous study in mice, the team had curbed the mutant gene’s activity for a few weeks, showing reversal of the bad symptoms in the diseased animals. By tweaking the ingredients of the zinc finger, in a new study they were able to extend its effects to several months, repressing the disease gene over that period without seeing any harmful side effects. This involved making the zinc finger as invisible to the immune system as possible. Project lead Dr Mark Isalan, currently at the Department of Life Sciences at Imperial College London and CRG alumnus said he is extremely excited by their latest results, which show a lot of promise for treating Huntington’s disease. “However, while these encouraging results in mice mean that the zinc finger looks like a good candidate to take forward to human trials, we still need to do a lot of work first to answer important questions around the safety of the intervention, whether repeat treatments are effective, whether there might be longer-term side effects, and whether we can extend and increase the benefits beyond six months," Isalan explains. This work has been a progressive journey from the work developed through the years by Dr Isalan’s team at the Centre for Genomic Regulation (CRG) in Barcelona to the current results at Imperial. “If all goes well and we have further positive results, we would aim to start clinical trials within five years to see whether the treatment could be safe and effective in humans. We are urgently looking for industry partners and funding to achieve this,” Isalan adds. Apart from being the starting point where this research was initially developed, the CRG owns the core patents protecting this technology and it is also committed to its transition from the lab into a real-life benefit. How do actually zinc fingers work? The mutant Huntingtin gene is thought to cause toxic levels of protein to aggregate in the brain. Preventing the activity of this gene could theoretically halt the disease, but this has been difficult to achieve. The gene is present in many different cell types in the brain, making it difficult to target, and every patient also has a non-mutant copy of the gene, which scientists need to avoid targeting with any intervention in order to prevent unwanted side effects. 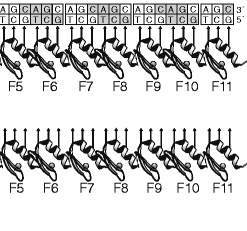 The zinc finger protein sticks to the DNA of the mutant Huntingtin gene and turns off the gene’s expression. “We don’t know exactly how the mutant Huntingtin gene causes the disease, so the idea is that targeting the gene expression cuts off the problem at its source – preventing it from ever having the potential to act,” said Dr Isalan. By targeting the fundamental DNA of the gene, the zinc finger therapy also has the advantage over other potential Huntington’s therapies of needing less frequent treatments. In the study, the researchers gave a single injection of zinc finger to 12 mice with Huntingdon’s disease. They examined the brains of the mice at different intervals after the initial injection and found that on average, 77 per cent of the ‘bad’ gene expression was repressed in mouse brains three weeks after injection of the zinc finger, 61 per cent repressed at six weeks, and 48 per cent repressed at 12 weeks. By 24 weeks after the initial injections, there was still 23 per cent repression, which is thought to still be useful therapeutically. The team are now working on ways to lengthen the repression period even further. Centre for Genomic Regulation (CRG) – Press office - Laia Cendrós.